What is Eufaula known for? Eufaula is rich in history with over 700 structures on the historic register. We are also touted as “Big Bass Capital of the World” by big bass tournaments which come to our over 45,000 acre Lake Eufaula. What’s the biggest thing that’s happened in Eufaula in the last 5 years? How has Eufaula grown their tourism industry in the last 10 years? Through the efforts of the Eufaula Barbour Chamber of Commerce tourism department, Eufaula has been represented in many Expos and arenas to assist in educating potential visitors regarding what Eufaula has to offer. We have participated in several BRAC expos in Kentucky to assist potential base relocation prospects, many military expos have been participated in so the leisure/day travelers are aware of what we have to offer as well as where we are. Retiree Expos and publications are also a very import key to advertising our strengths as a retiree location. Eufaula’s low property taxes and the fact the state of Alabama does not tax government retirement make it even more appealing for retiree relocation. What are some examples of regional collaboration that Eufaula has been involved with in the last 5 years? Eufaula has been named one of the 11 lakes on the newly formed Alabama Bass Trail as well as the completion of the Wiregrass Birding Trail in which Eufaula is home to 4 of the Birding Trail sites. If someone asked you to write a one paragraph description about what makes Eufaula great, what would you say? Eufaula has a little something for everyone. Fishing, rich in history, walkable community, beautiful downtown and a wonderful place to raise a family. 6. Name 5 things that have happened in the last 10 years that have helped keep Eufaula on the map. 1. Our historic travel such as monuments, museums, personal homes, etc…; 2. Our beautiful Lake Eufaula keeps anglers and water sports one of main attractions; 3. Eufaula’s central location is another key to being a travel destination. We are 45 min from Dothan, 1 hr from Montgomery, 1 hr to Auburn, and on the direct route from Atlanta to the beach. ; 4. Eufaula’s 2020 strategic plan – our long range plan of things we want our city to progress in. We have fulfilled probably 75% of the plan but since it is an open ended plan, which means we can add to it or delete, as our nation progresses, so do we! 5. Being written about and listed in magazines such as Where to Retire, Garden and Gun as well as Life 2.0 and Boom town. It is important that Eufaula competes with other cities our size all over the United States and to be named in a top spot in magazines and books such as listed above tells us we are doing something right! 7. Tell us a little about the rails-to-trails project? How many visitors use the trail annually? Locals? What other things has this project let to? This project began around 2002 and took about 7 years to complete. Neil Yarbrough, our former City Horticulturist, stayed with the vision and saw to it that this perfect addition to downtown was brought to fruition. Our current Horticulture department has done an excellent job in adding all sorts of paths, art, as well as upkeep to make our trail that is second to none. It is one of the very few trails that actually cross a body of water. Our trail is 3.2 miles long which is a perfect 5k in which we have held dozens of 5k runs on it so far as well as the local high school holds regional runs on it too. As mentioned above we have just completed the Wiregrass Birding Trail honors and our trail is one of the sites within Eufaula’s Birding Trail. Your Pilgrimage has been going on for years. How do you think this has strengthened the sense of community in Eufaula? How many people participate annually? Next week we are embarking on our 48th annual Eufaula Pilgrimage. 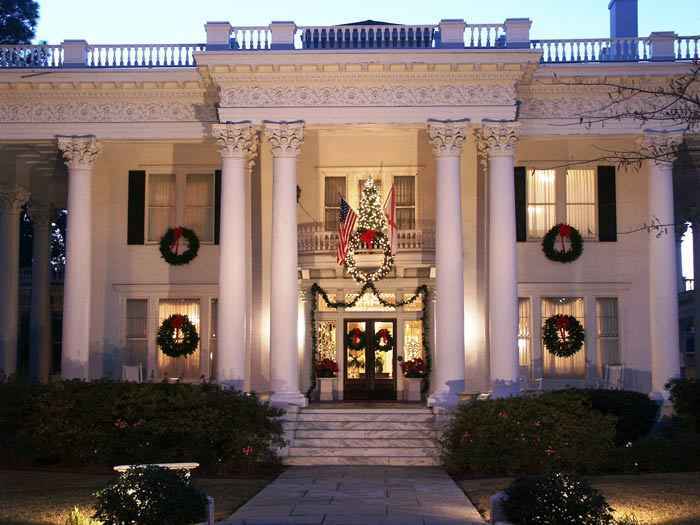 This makes us the state of Alabama’s oldest tour of homes. Every year, around Easter, the City of Eufaula’s residents carefully manicure their yards and homes and welcome out of town visitor’s to enjoy a little bit of history. This one event creates heads on beds, people enjoying our local fare and shopping in our stores. Proceeds from the Pilgrimage are primarily used for the upkeep of Shorter Mansion but the city of Eufaula benefits from the economic impact. Several thousand people attend this event whether a tour bus comes for the day or the weekend. It takes several hundred local volunteers to help pull off this event from being a tour guide to trimming hedges. You can always ask any local, who is a volunteer, how long they have been donating their time and we can assure you they began this community service when they were in grade school!